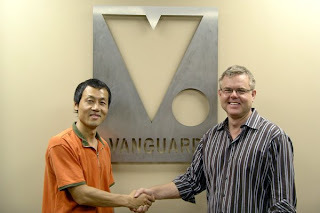 On October 25th, 2008 Young Man Kang, Director/Producer of Young Man Kang Films, signed a three picture distribution deal with Mr. Freyr Thor, CEO of Vanguard Cinema. The first two of three releases, award winning films 'Soap Girl' and 'The Last Eve' are available now on DVD. 'Cupid's Mistake', holder of The Guinness World Records will be out on DVD July '09. Vanguard is committed to releasing the quality filmmaking and filmmakers that otherwise would go unnoticed by the public eye. Vanguard brings forward festival award winning US independent feature films and contemporary foreign movies, all of critical acclaim featuring up-and-coming stars and directors. Vanguard has often promoted the career starting films of current major stars and directors. Young Man Kang Films primary vision and focus is building bridges between Hollywood and Asia. Over the past two decades Young Man Kang has directed and produced films and animation throughout the United States, Korea, India, China and Japan.